I wonder how many litres are in that Corona Light? I wanted a shot that would show both Times Square and represent the reason for my visit which was, of course, the Disney Store. So this shot of a huge Mickey Mouse seemingly climbing the side of a building like King Kong was ideal. Fortunately, I’m the only one who shot him! When I was first learning about Walt Disney World, the one name that kept coming up over and over again — besides those like Mickey Mouse or Walt Disney — was Lou Mongello. Lou is an icon in the Disney fan blog arena for good reason. He started his podcast WDW Radio in 2005, and it has been the winner of the best travel podcast award time and time again. Lou Mongello is an internationally-recognized expert and historian about the Walt Disney World® Resort. A former attorney and IT director, he is the author of 102 Ways to Save Money For and At Walt Disney World, the Walt Disney World Trivia Books (Volumes I and II), as well as the Audio Guides to Walt Disney World, in which Lou takes you on a virtual tour of the Disney parks and resorts, enjoying their details, history, stories and overlooked experiences, all with the ambient sounds of the parks surrounding you. A keynote speaker at numerous events nationwide including fan gatherings and corporate events, Lou has also appeared on television as a Disney expert, and has been interviewed, written for or been featured in: the Orlando Sentinel, StarWars.com, Robert Scoble, Southern Living Magazine, Cookie Magazine, Fodor’s, The Unofficial Guide to Walt Disney World, and numerous others. He is also the founder of the Dream Team Project (http://DreamTeamProject.org). He and numerous volunteers have been raising money for the Make-A-Wish Foundation of America since 2003 to send seriously ill children and their families to Walt Disney World. 102 Ways to Save Money for and at Walt Disney World is just that — 102 ways to save money on your vacation! Contained in this book are some really great ways to save money, and while they are certainly geared towards your Walt Disney World vacation, if you expand the thoughts some, you’ll find that many of these money saving tips can be applied in your own life, and for other vacation destinations as well! As a result, this is a great resource for any person to have in their possession. Chances are, if you are on my site, or any of my friends’ sites, you are a Disney fanatic. You live, breath, and experience Disney as much as you possibly can. Disney Magic is so much more than just a marketing term for you — it is the key to making memories with your family that will transcend the boundaries of time, space, and age (your kids ages, not yours of course!) and remind you all why you love one another like you do. For my family, the price of those memories is indescribable — and that is why we go to Walt Disney World every year, sometimes twice a year. I know that in today’s day and age, credit is a term that is often used interchangeably with cash. I also know that, with the way that the economy has been, and with all of the negative news that we have endured for what seems forever, the idea of making our own memories and creating lasting memories that we will remember for a very long time is a very strong pull. However, it’s extremely important that we stay realistic about our finances. That’s why I feel so strongly about Tip #8. Memories are incredible things — but if your finances are not able to experience Disney in person, then I urge you to experience Disney at home, and there are many ways to do so. As I explained before, the tips contained in this book are great for many different vacation destinations, not just Walt Disney World. Additionally, while many of these tips can be found on the Internet at various websites, it takes a great deal of work to track down all of those tips and consolidate them so you can look them up at a moments notice, and because of all of that, Lou’s book really is worth the $15 (or less) it will cost you. If you like to go to Walt Disney World, take the time to get this book, and put it to the test — use it and find out how much you save on your next Disney vacation! 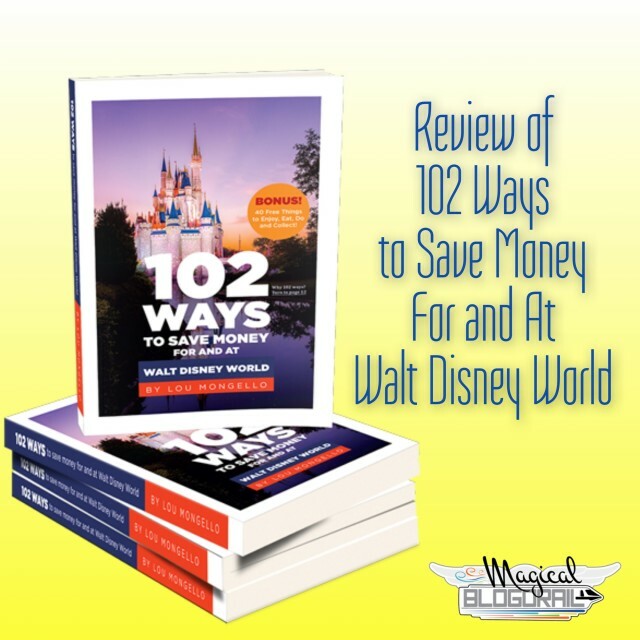 If you would like a copy of Lou Mongello’s 102 Ways to Save Money at Walt Disney World please enter to win our giveaway below. Please click here if the entry widget is not shown below.